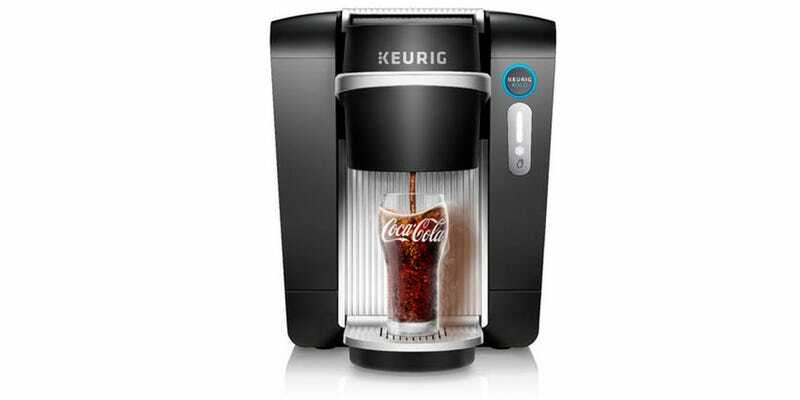 Keurig, the company that stole all your money with its annoyingly convenient coffee machines, has just announced a machine that might do the same thing for soda. The $370 Keurig Kold is exactly like Keurig’s coffee machines, except for carbonated drinks: fill it with room-temperature water, pop in a capsule, and it spits out a perfectly chilled, perfectly fizzy soda. Unlike Sodastream, there’s no CO2 canister required, and thanks to partnerships with Coke and Dr Pepper, you can make legit Coca-Cola at home. Keurig has apparently spent years developing the machine, which is meant to turn around the company’s fortunes, following bad press over coffee machines that scald people (and DRM-enabled coffee). The real magic is in the pods — to avoid the need for a CO2 canister, the pods contain both the flavor syrup, and ‘carbonation beads’ that provide the bubbles. All told, the entire process, including chilling the water to 44 degrees, takes around a minute. In terms of available drinks, you’ve got Coke in all its different varieties, Sprite, Fanta, Dr Pepper, Canada Dry, and some home-brew Keurig generic brands. There’s also a promise to include cocktail mixers, which adds another neat dimension. The catch, of course, is the price: $370 upfront for the machine, which is bad, but not as bad as the pods: Around $4-5 for a four-pack of pods; each pod can do one single 8-ounce serving. Given you can get a 12-pack of Coke for $5 online, that’s a big premium for saving just a little fridge space. Despite the awful price, I can still see the appeal of the Kold, and I have this sinking feeling I’m going to end up buying one. Drinking sugar water from a gigantic, secretive corporation is bad; buying a $370 machine and an endless supply of $5-a-box capsules, just so I don’t have to remember to refrigerate my cans, is downright slothful. But I’m probably going to do it anyway. The Keurig Kold is going on sale online today, with a full retail rollout expected by the holidays.